Yes, I blog, but no, I'm not obsessed with Pinterest. Quite frankly, I'd rather read a blog post about a recipe someone got from Pinterest than go on Pinterest itself. Does no one else feel completely overwhelmed by the hundreds of pins per page? Anxiety Level: High! 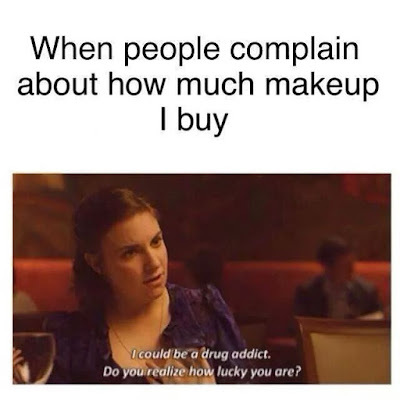 Yes, I love makeup, but no, I'm not stupid. 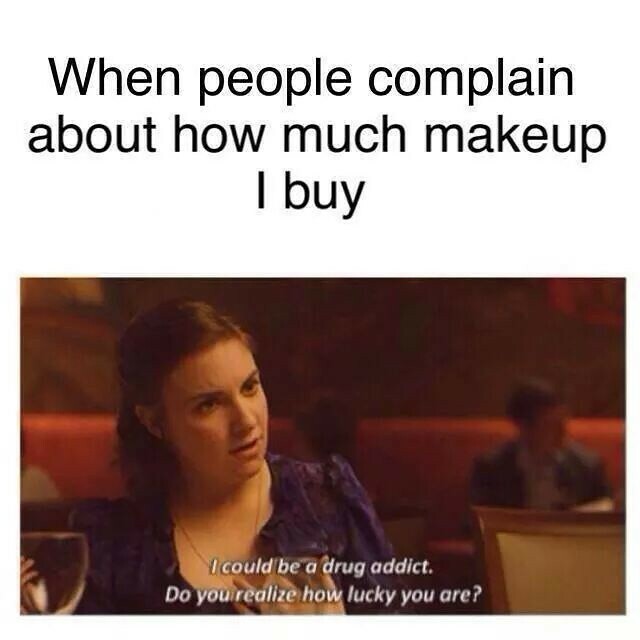 There is such a misconception that if you love wearing/playing/collecting makeup you must have low self-esteem. Or be really conceited. Or have nothing else going on upstairs. The plain and simple fact is putting on my favorite lipstick can totally make my day, the same as having a nice cup of coffee or reading an inspiring quote. Do what makes you happy! No, I'm not interested in exploiting myself for gain. Have I been offered free stuff? You bet I have. Do I take it? Not always. If I truly believe in a brand or I would have used the product or site anyways, then I have no problem supporting and writing about it. But the point of my blog isn't to make money, it's to write about the things I love and share them with people who appreciate it as much as I do, because that's what I like to do. I consider it more of a hobby than a money maker. It amazes me how many people ask me straight up if I do it to make money. Um, no. Yes, I love ALL my followers, but no, I'm not aiming towards any set goal. I am as happy at 700 followers as I was at 1 ~ I am always just stunned and humbled that anyone would care enough to check out my blog, read my posts, leave amazing comments or even bother following me period. If I lost all my followers today, I'd be thankful I had any to begin with! I love hearing the things people come up with when you tell them you're a blogger. Tell me some of the humorous things you've heard (or even assumed yourself!) about bloggers. P.S. You guys, I just want to note that none of this is intended to be offensive! Whilst a lot of bloggers do all of the above and that is amazing, my point is we all don't fit in one tiny box of expectations, blogging is different for everyone, and that's what makes it so great! Have a wonderful day everyone! This solidifies, if people don't already know, why you are so AWESOME!!! I am on the same page as you on all of these!!! I even had a colleague ask me if I was going to quit work!! Ha, guess they didn't hear me when I have answered 11 other people that I do not make money from it. My favorite quote from this "do what makes you happy!!" Amen sista!!! Happy Friday eve you beautiful and wise woman!!! This is such a great post Kim! I think this is why I don't tell most people in "real life" about my blog; there are just so many misconceptions about what blogging is and isn't. Also, I totally agree with the Facebook thing. I am always behind when it comes to technology and I don't think that's a bad thing. Pinterest is another story! I am obsessed with collecting recipes and photos on that site. Do I ever use them? No, but doing so makes me feel like I am exercising some weird control over my life! I love this post so much Kim! I always get people thinking that because I love fashion and makeup that is all there is to me, it's ridiculous! Such an inspiring post beautiful keep doing what works for you! You are an amazing lady and blogger! Hope you have a super amazing week!! xox Lots of love your way!